The Genting Malaysia Scholarship is aimed to help ambitious students across Malaysia reach their fullest potential. 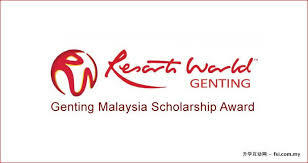 The Genting Malaysia Scholarship Award (GENM Scholarship) provides qualified young Malaysians with the golden opportunity to further their studies locally or overseas. We offer financial assistance for students who have excelled academically and demonstrated active leadership to undergo their undergraduate studies. This scholarship will help qualified recipients to establish a strong foundation for their future in the following fields. Malaysian citizen aged 23 years and below. Must be waiting for admission to pursue a full-time degree course in a local or overseas university. Strong leadership skills demonstrated through active participation in extra-curricular activities. Family household income not exceeding RM5,000.00 per month. For the preferred fields and approved universities, please refer to FAQ. All scholarship applications and supporting documents must be submitted via the online submission system before the closing date. All required fields (i.e. personal particulars, information on courses applied, particulars of parent/guardian, education background, etc.) must be completed. Incomplete applications will be rejected. One (1) page PowerPoint summary of yourself, illustrating your personal profile, aspirations, academic background, and any other relevant facts. The total size for all attached documents should not exceed 6MB and each attachment’s size should not exceed 500KB. Please ensure that you meet the size requirements before submission because you will not be able to submit your application otherwise. Optional: Applicants are encouraged to submit a Vsume uploaded onto Youtube (>60 seconds) as an added advantage. Applications are to be submitted online. Please note that application is only available online. GENTING MALAYSIA DOES NOT ACCEPT HARD COPIES OF ANY DOCUMENTS. Only shortlisted candidates will be called for an assessment.